LAST DANCE @ New Museum's IDEAS CITY - mudd up! It’s always exciting to collaborate with Sharifa Rhodes-Pitts, author the beautiful, thoughtful book Harlem Is Nowhere. This Friday, May 29, we’re staging a new work in NYC, at the New Museum’s IDEAS CITY Festival. The evening is “a performative conference in 9 acts,” ranging from dance battles to spoken word to something involving a hot air balloon; we go on promptly at 11pm. Our contribution, The Last Dance, is a half-hour piece about the Renaissance Ballroom in Harlem, which was demolished this past March. 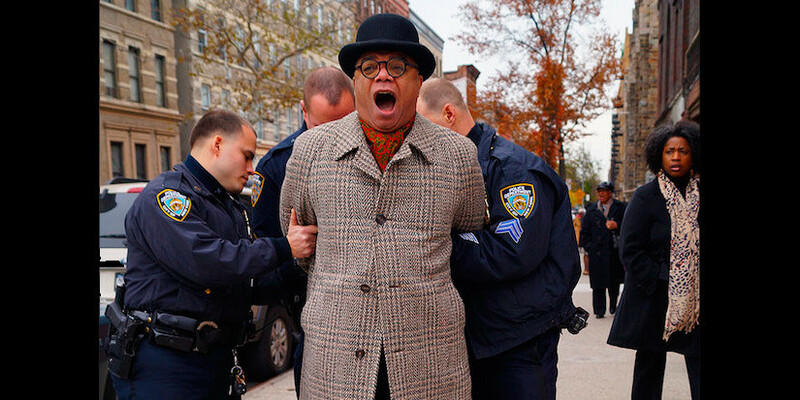 We’ll be joined by historian Michael Henry Adams (pictured above being arrested as he protested its destruction). This article provides context. Friday May 29. The Aula, 268 Mulberry Street. DJ Rupture, Sharifa Rhodes-Pitts, and Michael Henry Adams present The Last Dance, part of A Performative Conference In 9 Acts.